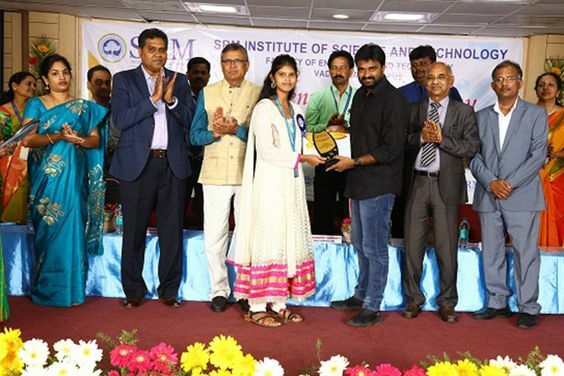 SRMIST, Vadapalani campus cheerfully celebrated its Decennial Annual day with a lot of relish on 22nd March 2019. The celebration commenced with the presence of our highly esteemed Vice Chancellor, Dr. Sandeep Sancheti, Mr. J. Chandra Kumar , IAS, Campus Director and the Chief Guest Mr. Venu Uppalapati, RMG Global Head- Chennai Region, Tata Consultancy Services, and Guest of Honour Mr. A.L. Vijay, Film Director. The Annual day turned out to be a jubilant occasion with the welcome address given by Dr. K. Duraivelu, Dean (E&T). The Chief guest Mr. Venu Uppalapati, as a electronic engineer, he spoke about recent technological innovations in Industry 4.0, IOT, Cloud computing, AI, Virtual Reality, etc. Later he advised the budding engineers to equip themselves to be capable of getting lot of career opportunities in the above said fields. At last he insisted about both personal and work ethics which is the key to success. Director Vijay congratulated the award winners and advised the student community to come forward with their passion along with their academics. He also quotes that hard work never fails. Mr. Harish Kalyan, Actor, graced the Cultural events after the award ceremony. The students who have excelled in academics, sports, clubs, were awarded with prizes, to enliven them. Awards were facilitated to the achievers from academic and Co-Curricular areas.